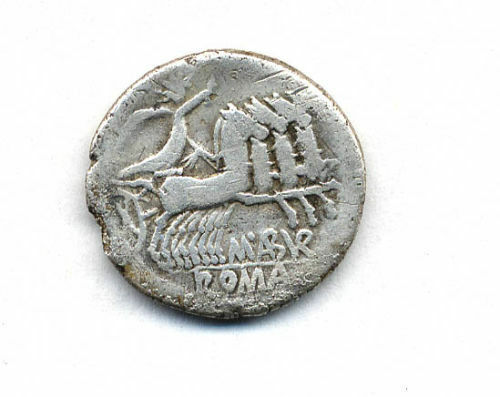 Roman republican denarius of M. Aburius Geminus in 132 BC (Crawford, M. H. 1974. Roman Republican Coinage, ref. 250). 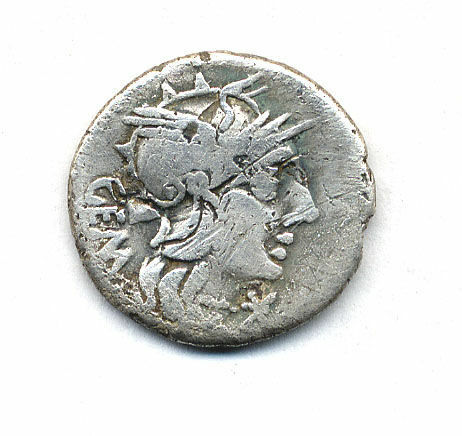 On the obverse is the helmeted head of Roma facing right, with a star in front and the letters GEM behind. The reverse has the sun god Sol in a four-horse chariot with M. ABVRI below and ROMA in the exergue. This is the second oldest Roman coin to have been found in the Colchester area. An issue of M. Iunius dated to 145 BC (ibid, ref. 220/1) was found at Lion Walk during excavations in the early 1970s. This coin was recorded before a Finds Liaison Officer was appointed to Essex and the object description is a transcription of the record made at the time. This record was published in Wise, P. 2002. 'Recent finds from Essex reported to Colchester Museums 2001-2', in Essex Archaeology and History 35 (2004), page 224, ref. 1. This coin was acquired by Colchester Museums - Accession Number 2003.150. Obverse description: The helmeted head of Roma facing right, with a star in front and the letters GEM behind. Reverse inscription: M. ABVRI below and ROMA in the exergue. Republican moneyer: Aburius Geminus, M.